Things have been very full-on around here and it probably won't let up for a bit. I found this pattern half completed in my journal when I picked it up today, so I finished it off. 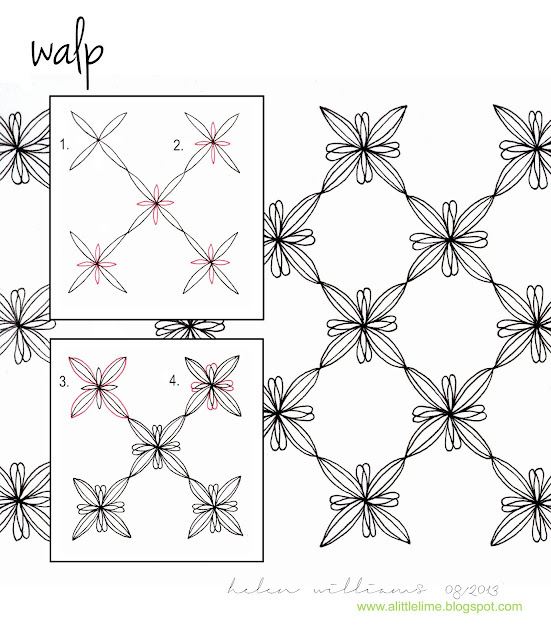 Reminds me of wallpaper and I am too mentally drained to come up with a clever name, so just dubbed it walp. They don't call me the super-duper pattern namer for nothing, baby! Probably not as detailed as my usual instructions, but the steps are pretty straight-forward. I want to have a play with it on a design when I get a chance as I think shading would really look great. Although that name at least makes sense. It's funny, I finally stopped subscribing to tangle patterns because the names of the patterns drove me INSANE. I've just seen your comment..So funny. I've taken ages too to get over hating the names and just loving the art! Super pattern, going to give it a go. Bales, gone elegant. Thanks for sharing. I will give it a try. pretty pretty pretty... thanks for sharing. Love it! Simple and elegant. Hugs from San Diego!